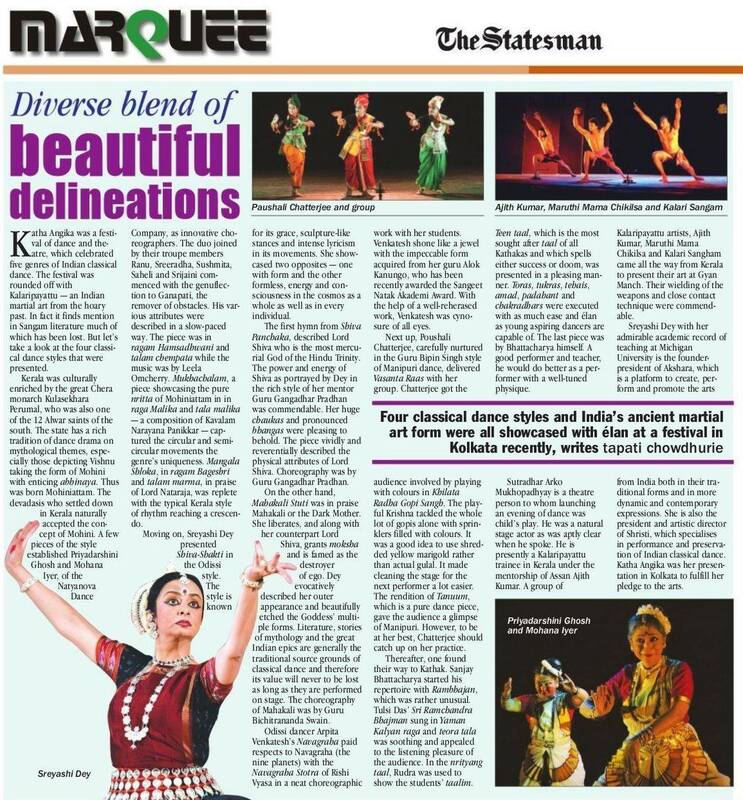 As part of Akshara’s international outreach program in 2017, this festival presented the best in Indian classical dances to the appreciative audiences of Kolkata. It featured five distinct styles of classical dance and Kalaripayattu, a martial arts form from Kerala, woven together by spoken word. This evening was unique in dramatically presenting each performance piece as a story, in its own regional setting and historical context, while also connecting these segments as part of an interconnected whole, deriving its roots from the ancient treatise, the Natyashastra. By using theater and spoken word, an actor introduced and connected each performance, while the dancers used their movement and expressive vocabulary to narrate stories, present virtuosic rhythmic dance and highlight unique cultural aspects of their chosen styles of classical dance. The following eminent and internationally recognized artistes performed in this festival. Sreyashi Dey is one of the foremost exponents of Odissi in the US, and the Founder and Artistic Director of Srishti Dances of India. She is also the founder of a multi-arts non-profit organization, Akshara, based in Ann Arbor, Michigan. Previously also an exponent of Bharatanayam, as a thoughtful artist, she constantly expands her creative horizons with new choreographies and collaborations across artistic genres. Priyadarshini Ghosh, Artistic Director of Natyanova, has been an established Classical Mohini Attam dancer, as well as Contemporary dancer and choreographer for the past many years. A MFA in Dance and a Fulbright Scholar 2015-16, she has completed a senior fellowship in dance research from the Min of Culture, Govt of India. She performs and lectures actively in many prestigious venues and festivals both as a soloist and also with the repertory. Mohana Iyer, Associate director of Natyanova, is an accomplished artiste, choreographer and trainer in Indian Classical dance forms of Bharatanatyam, Kathakali and Mohini Attam, performing and teaching for several years. She is a MFA in dance. Her performances and choreographies in Bharatha Natyam, Mohini Attam and Kathakali have received critical acclaim. She is a trained Carnatic vocalist and a Nattuvannar. Poushali Chatterjee began her training in Manipuri Dance from the age of 8 under Shri Kunjo Singh. After her initial training she took lessons from Smt. Darshana Jhaveri and Smt Kalavati Devi. Finally she came under the tutelage of the legendary Guru Bipin Singh, from whom she learnt the finer nuances of the dance style. Being a gifted and dedicated student, Poushali received a National Scholarship at the age of 12. With a natural grace and sense of tala, she became equally adept at tandava, lasya and abhinaya. Her interest in learning all aspects of this form made her learn how to play the Manipuri drum or Pung. The same interest also motivated her to take training in Thang-Ta, the Manipuri Martial Arts, from Ranjeet Chingtham, an accomplished exponent of this form. In 1996, Poushali opened her own institution, Nandanik Manipuri Dance Academy, where she teaches her students the various styles of Manipuri Dance. Arpita was initiated to the age old art of Odissi Dance by the maestro Guru Shri Muralidhar Majhi. Her talents blos­somed under the devoted guidance of the re­nowned Odissi exponent Smt Aloka Kanungo in Shinjan Nrityalaya. Arpita has received the prestigious Junior Fellowship from the Ministry of Tourism and Culture, Government of India, to do research on comparative studies on “Karanas”. She has stood third in the Masters Degree Examination at Rabindra Bharati University and she has also secured third position in Sangeet Bivakar Examination under Bangiya Sangeet Parishad and has a unique distinction of procuring Nritya Ratna from Bangiya Sangeet Parishad and Sangeet Prabhakar from Prayag Sangeet Samity. Arpita is engaged in bestowing her knowledge of Odissi to her students at her own school Malashree. Imbibed with the sensual and graceful elements of Luckhnow Gharana, Sri Sanjay Bhattacharya has emerged as an established Kathak dancer and choreographer of today. Having formal training from Nrityashiromani Guru Bandana Sen, he is also fortunate to have the guidance from Guru Omprakash Maharaj, Pt. Birju Maharaj and Kumudini Lakhiya. Some major achivements in his successful career include the State Government Scholarship,Grade-A artist of National Doordarshan, Sringarmani and Sangeet Kalabid award. He has performed in various dance festivals in India & abroad such as International Art Festival St. Petersburg, Russia, Cultural Exchange Program, Germany, Kal-ke-Kalakar, Swami Haridas Sangeet Sanmelan, Sisir Utsav by EZCC, Vasanta Utsav by WBSMC and Uday Shankar Nrityotsav. He is the founder-director of “SHRAVASTI,” a school of Kathak.